Riding unicycle is to train your balance and strength. Whether you are a novice or a professional rider, it is rather important that you choose the right unicycle with good quality. And with somatological design and top quality, this is just the one you are looking for! 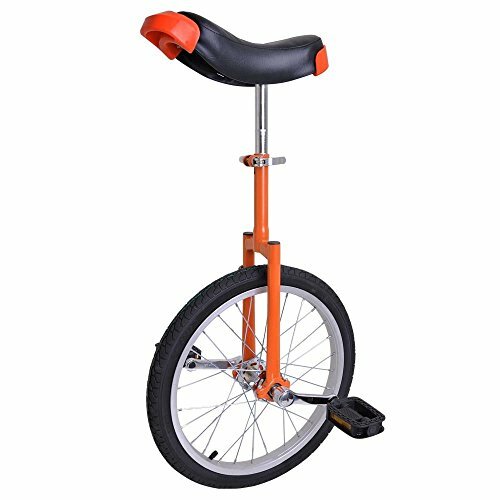 Remember when you're seated on the unicycle, with one foot on a pedal in its lowest position, your leg should be almost straight. Novices should ride under the instructions or accompany of your tutors for safety. And the best place for your training is a back deck or a baseball field with a chain-link fence. Pick a grassy area with solid, flat dirt and you can hold onto the fence. If you have any questions about this product by Globe House Products, contact us by completing and submitting the form below. If you are looking for a specif part number, please include it with your message.